To me, there is nothing better than feeling the sun against my skin, the wind playing with my hair, and the earth beneath my feet and hands. We spend so much time inside, on our devices, and sucked into social media that it’s easy to feel disconnected. I am completely guilty of this but, I’ve become more aware of how these habits have impacted me. 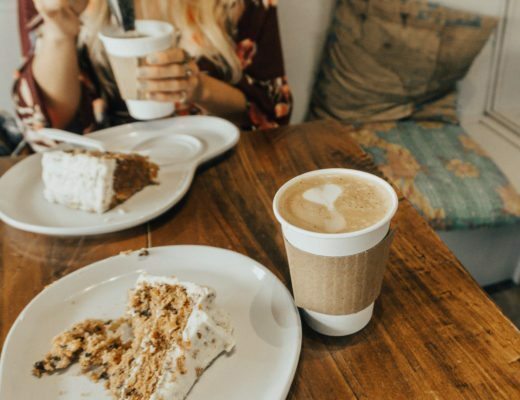 I’ve found that when I start to feel a disconnection from myself and my gut instincts, I simply need to take more time to get present. Maybe you feel the same way? Throughout my years of practice, I have found that the quickest way to bring myself into the present moment is to be in nature. The second way is through my yoga practice. And combined, I feel like I am leaving my practice on cloud nine. Since I love bringing my practice outside, I thought I would share the benefits that I have found to encourage you to do the same. It wasn’t until college that I learned about earthing, also known as grounding. Earthing is the concept of receiving free-radical-busting electrons from the Earth’s surface through the connection of your body to the ground. 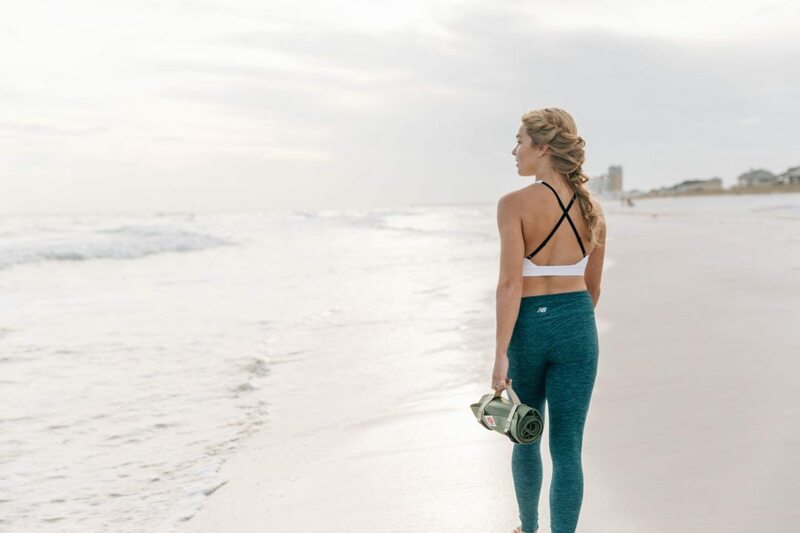 Earthing calms our sympathetic nervous system and is a powerful antioxidant that can improve your sleep, enhance your wellbeing, reduce inflammation and more. I remember that as soon as I could drive, I was going out to the beach almost daily to listen to the waves, collect shells, feel the sand between my toes, and gaze at the moon and stars. There has always been something soothing about being present in nature. Feeling a connection to something greater than yourself. By bringing your yoga practice outside you are inviting the opportunity to ground into your connection to the earth. Also, practicing on an uneven surface helps to strengthen your core and the muscles of your feet. 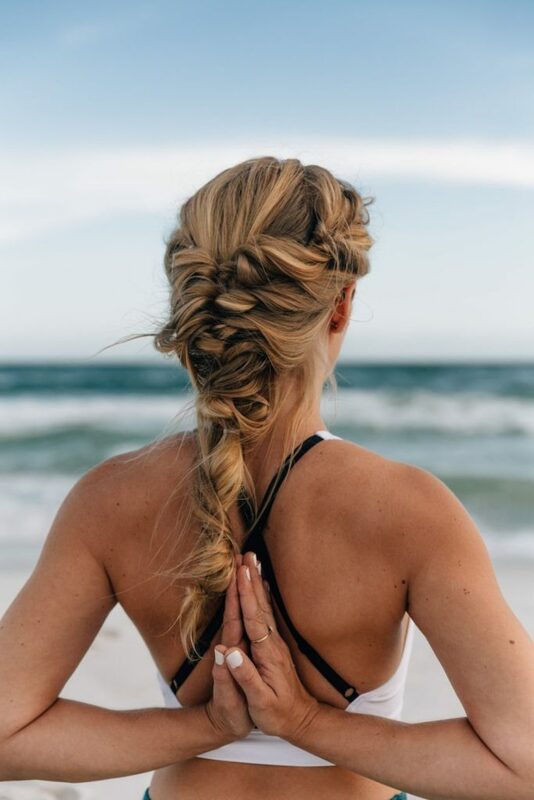 I like to practice with my mat* when I am out at the beach because our sand is so soft but, when I meditate, my hands are buried in the sand, feeling the earth between my fingertips. Can you think about how it feels to take that first breath of fresh air when you arrive at the beach, lake, mountain, or wherever your nature destination might be? It feels invigorating, doesn’t it? Breathing in fresh oxygen is a great way to bring your awareness to your breath. To really notice how you are breathing and where you are sending your breath. I love to emphasize breath awareness to my classes and when I taught outside I noticed how much easier it was for my students to come home to their breath to become more present. Feeling the sensations of the elements around you is a great way to become present. If you are in the mountains you can imagine yourself embodying their strength and grounding throughout your practice. Maybe feeling the stones beneath the soles of your feet, the wind playing with your hair, drawing you into the present moment by the mere joy of their presence. 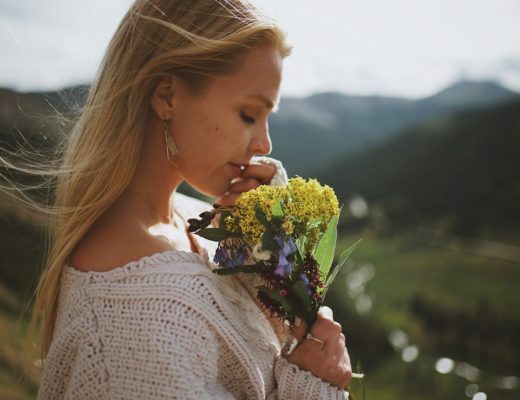 The wind is a wonderful reminder to pause and enjoy the cool feeling of it, bringing an awareness to your breath as you breathe in the fresh cool air, and reminding you to flow freely in your practice. Perhaps, you are near water and the sound of the waves is your anchor. Washing away what needs to be let go and leave you feeling cleansed. When you bring your yoga practice outside you’re inviting every moment to draw you into the present moment. To distance yourself from worrying about the past or future and to begin to feel connected to your intuition. I know that it’s challenging to bring your practice outside when you live somewhere very cold, but having a view or lots of natural lighting is still a great option that can increase your internal focus and feeling of a wakeful relaxation. When you bring practice outside instead of the confines of the yoga studio, you’re stepping outside of a comfort zone. You’re trusting your own intuition of what you should do next in your flow and you’re allowing the nature that surrounds you to inspire your practice. Studies have shown that even a small connection to nature can calm the mind and body. You don’t really need evidence to give you proof of how being in nature or having a view of nature is calming and reduces your feelings of stress. When you allow yourself to feel connected to the life that is around you, to play outside and feel in sync with all of the energy around you, you are allowing your awareness to expand. It feels soothing to just let yourself be present. To embrace the joy of feeling connected with all that surrounds you. *The yoga mat in this post was provided by YOGO. 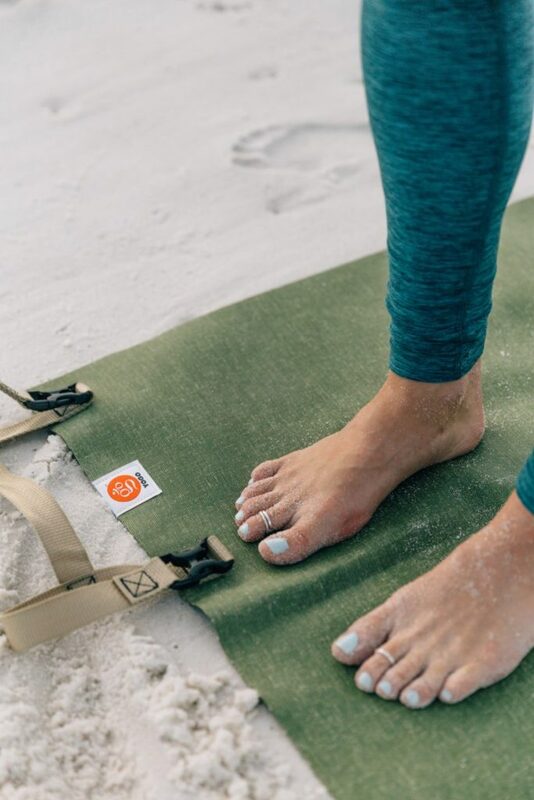 I am a huge fan of this travel yoga mat! Both sides have great grip, they’ve made it easy to clean and very portable with their straps. Best of all, each purchase of a YOGO mat provides a fruit-bearing tree to a poor family in an African or Latin American country.